That’s my idea for V-Day anyway. I’m big on hand-crafting shared, cherished memories whenever I get the chance. I spent my yesterday in the craft store, Michael’s, browsing the aisles, coming up with too many ideas than my brain could handle. One idea I’ve been wanting to breathe life into for a while now was having a jar or bottle and filling it up with words of adoration. Luckily I have myself a gem of a man, so I got to work on my project for our fourth Valentine’s Day together. I took 27 of my circular blank stickers and wrote out reasons why I love and appreciate Tim on each one. The stickers were about the same size as the base of a peanut butter cup, so they fit perfectly on the bottoms of the chocolates. 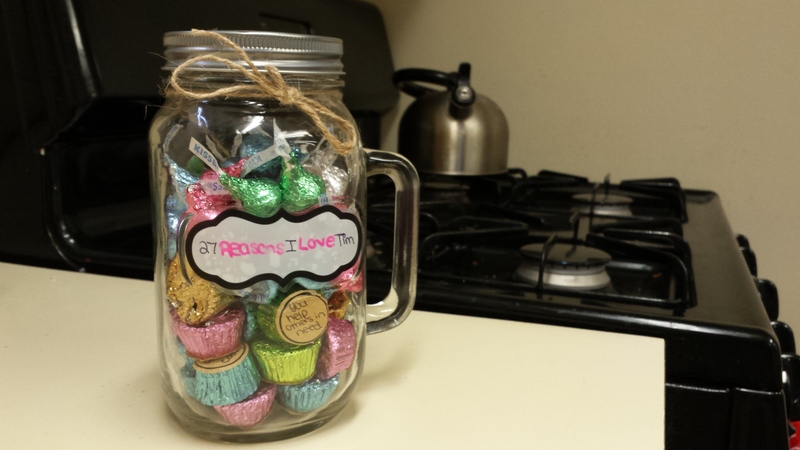 After I came up with 27, I plopped them in the jar, and then dumped in a bunch of Kisses. 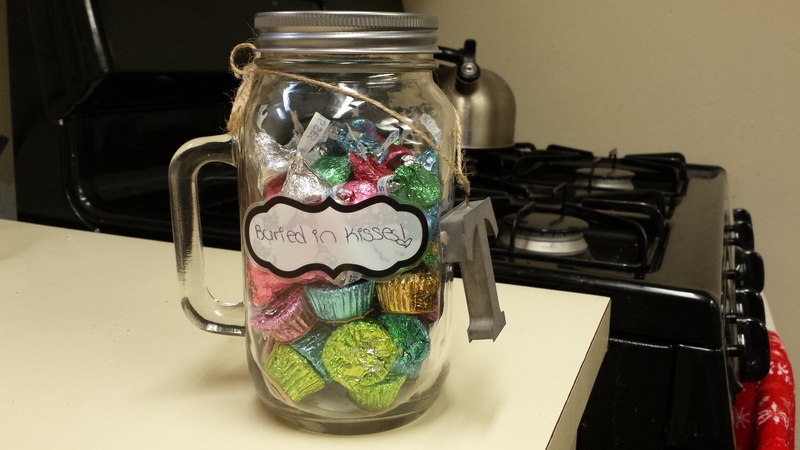 I think this is a thoughtful, creative way to show someone you care about them. In my mind, it beats going to the local drug store, snatching up an overpriced heart-shaped box of mediocre, mass-produced chocolates like a drone, and doing so just because you feel like you have to. Creating something personal from the heart is loads of fun, and giving your lovebug a super special work of art just for him/her and no one else is such a great feeling. Feel free to steal my idea and spread the love.